A quarter of a century has passed since the end of the Cold War. In the West, a new generation of leaders is in power, most of whom had little personal involvement in the East-West standoff that defined international politics for most of the post-1945 era. By contrast, Russia has been under the stewardship of a leader who came of age politically with the fall of the Iron Curtain. Mikhail Gorbachev recently warned that a new Cold War is emerging. But what, if any, are the links between the events of 1989 and Russia's intervention in Ukraine in 2014? Can we make sense of Europe's renewed confrontation with its eastern neighbour by peering into the past? Reflection on the events of 1989 sheds light on those of 2014 in two ways: by illustrating how Vladimir Putin's personal experiences of the end of the Cold War have shaped his foreign policy priorities, and by highlighting the importance of Mikhail Gorbachev's acceptance of the Helsinki principle in shaping the post-Cold War European order. "One of the women was screaming, ‘Look for the entrance to the tunnel under the Elbe River! They have inmates there, standing up to their knees in water.' What inmates was she talking about? Why did she think they were under the Elbe? There were some detention cells there, but, of course, they were not under the Elbe. I accept the Germans' crashing their own Ministry of State Security headquarters. That's their internal affair. But we were not their internal affair. It was a serious threat. And we had documents in our building. I phoned our military representatives and told them what was going on. And they said, ‘We cannot do anything until we have orders from Moscow. And Moscow is silent.' A few hours later, our military did come and the crowd dispersed. But I remembered that: ‘Moscow is silent.' I realized that the Soviet Union was ill. It was a fatal illness called paralysis. A paralysis of power." Two points are noteworthy here. First, Putin does not acknowledge that the USSR's imperial presence in Eastern Europe was something the local population opposed. The idea that a Soviet spy base (complete with an in-house detention facility) would be an undesirable presence in a foreign country 2000km away from home seems alien to Putin. The same goes for the demonstrators' concerns about political prisoners inside this base. Second, what struck Putin most about these events was the powerlessness of the Soviet state when confronted with a challenge to its core interests. This chimes in with the present, insofar as Putin has designed an activist foreign policy strategy based on the idea that the Russian state should never again be in a position that leaves it unable to shape events affecting its international position. Russia under Putin has consistently embraced intervention – whether military, paramilitary, or clandestine – where its perceived interests are disturbed. In 2005, Putin infamously referred to the end of the Cold War "the greatest geopolitical catastrophe of the 20th century," an unconventional choice considering the catalogue of calamities that filled the previous century. He has never publicly elaborated on what he believes caused this catastrophe. Then again, the reasons for the USSR's failure are well-understood. Soviet rule collapsed because it relied on terror to maintain political cohesion, robbing the system of legitimacy, and because its economic and technological performance fell behind its capitalist competitors. The fall of the Berlin Wall spelled the beginning of the end of Soviet dominance in Eastern Europe. The Warsaw Pact's ancien regimes were already struggling to stay afloat when the Wall crumbled overnight on 9 November 1989. Within two years the Iron Curtain had disappeared and the Soviet Union was history. The speed with which all this happened is perplexing. As Henry Kissinger has observed, never before in history has an empire collapsed so suddenly without an accompanying great power war. The revolutions of 1989 are at the heart of this story. Set in motion by people power and managed through adroit diplomatic manoeuvres, 1989 eventually ended up re-shaping the European order and in the process enshrined a liberal political principle at its core: the concept of freedom of choice, both of governments and of alliances. This is the cornerstone of the post-Cold War era, at once its least-recognised and most important legacy. Vladimir Putin, however, seems to have drawn a different set of conclusions. All the more important to explore the details surrounding the Cold War's end. Two factors explain how 1989 relates to Europe's geopolitical present. First, the basic but essential point that Eastern Europe's revolution was started, led and finished by its people. By 1989, the Soviet Union had lost its legitimacy; it was an empire with no clothes. The second is German reunification. While today we regard the idea of a German nation divided into two states as a strange anachronism, united Germany is still less than half the age of its two predecessors. It is easy to forget that the process of reunification was viewed with trepidation by the rest of Western Europe, even though (or because) it meant the loss of the Soviet Union's crown jewel. Germany was the arena over which East and West first collided after defeating Hitler; its divided capital encapsulated Cold War tensions, and its separation symbolised the wider conflict between two alternative modes of political existence. In many ways, to understand German reunification is to understand the end of the Cold War. By October 1989, the GDR neared bankruptcy. For months, peaceful popular unrest had been growing in scale and fervour. Mass demonstrations took place in all major cities, and representatives of the government and security apparatus were openly booed, jeered and mocked. Here was a people's revolution at work: on November 4, the Stasi reported 500,000 protestors on the streets in East Berlin, as well as tens of thousands in more than 40 separate demonstrations up and down the country. The sheer numbers forced the Stasi to shift tactics. Keeping a lid on dissidents through arrests and harassment was no longer feasible. Officers were reduced to reporting the slogans and demands of the demonstrators. After the government announced land reform – ‘Bodenreform' – protestors in Leipzig demanded ‘Hodenreform' – testicle reforms: ‘Get rid of these old sacks!' At the same time, tens of thousands of East Germans were pouring through the Iron Curtain's first cracks in Hungary and Czechoslovakia. The combination of mass demonstrations and a citizens' exodus paralysed the government and economy of the GDR. Its leader Egon Krenz informed Moscow that his government faced a US$12bn deficit. After Gorbachev's initial shock he coolly advised Krenz to "find a way to let the citizenry know that the country had been living above its means for a few years now." No further financial assistance was forthcoming from Moscow. Stasi reports covering West German opinion included a snippet from future Foreign Minister Joschka Fischer, then a young MP, in which he argued that the GDR now faced only two alternatives: fundamental political and economic reform ('Hungary') – or a brutal massacre of its own populace ('Tiananmen'). Gorbachev took the latter off the table, announcing to Krenz, ‘You cannot treat the people as your enemy!' Absent Soviet help, only West Germany was now in a position to provide economic assistance. As the crisis worsened across Eastern Europe, Gorbachev remained firm and refused to continue underwriting Moscow's sclerotic satellites with manpower and money. Did Gorbachev know he was in effect pulling the rug from under the USSR's feet? All the evidence suggests that he hoped that a new generation of more liberal but still Soviet-oriented leaders – little Gorbachevs – would fill the void left by the faltering governments. The one scenario he did not adequately prepare for was a swift reunification of the two Germanies. When George Bush Sr. raised the issue with Gorbachev in Malta in December of 1989, the Soviet leader registered his objections calmly, almost nonchalantly. Marshal Akhromeyev, Chief of the Soviet Army's General Staff, later blamed Gorbachev for this relaxed demeanour, arguing that it left Bush with the impression that reunification would not be a red line. A few days after Malta, Bush showed uncharacteristic audacity at a dinner with Kohl: when the Chancellor tentatively brought up reunification, Bush immediately expressed his unqualified support. In a recent interview, National Security Advisor Brent Scowcroft remarked that he did not expect his boss to arrive at such a momentous decision so rapidly; Scowcroft never quite understood what prompted him to do so. Bush, after all, had a legendary reputation for being a cautious, prudent tactician. He was not an idealist attracted to grand, sweeping designs for international order, like the ones Woodrow Wilson and FDR tried to craft in 1918 and 1945. Well, there was nothing prudent about this: Bush chose to support reunification without reservation, there and then. It was a bold move, reflecting considerable vision, which ended up reshaping the European continent. The essential complexity of the Cold War's end rests therein: while some developments like the crisis in Eastern Europe and the collapse of Communism were by 1989 almost inevitable, the shape of post-Cold War Europe was entirely uncertain. As the Warsaw Pact disintegrated, the choices and strategies of the various players became central, and these were far from pre-determined. Bush's choice to back Kohl was the first in a series of manoeuvres to fill in the blanks. After it became clear that Kohl's desire for reunification had mass appeal in Germany, Bush needed to maintain a difficult balancing act: mollifying Europeans anxious about Germany's revival on the one hand, and preventing a policy U-Turn by Gorbachev on the other. The latter was more challenging. East Germany was the USSR's grand prize from the Second World War, a gateway to Eastern Europe. It would not be given up easily. Bush's tactic was to play a waiting game in the face of the USSR's steadily deteriorating position, as its economy imploded and even the Soviet republics began to fight for independence. There was an alternative, proposed by foreign policy grandees like Henry Kissinger: pursuing a conservative – prudent? – strategy of locking in gains through a grand settlement, a so-called ‘Yalta II'. This would have solidified a degree of Soviet retrenchment and averted the risk of Gorbachev being overthrown by his increasingly resentful military establishment, which was intent on reasserting control over Eastern Europe. Ultimately, Bush decided that the risks were worth it. A coup against Gorbachev did eventually take place, but only in June 1991, by which time all it achieved was hastening the Soviet Union's disintegration. Even so, for the Soviet military, retreat from Eastern Europe was strategically disastrous. The Cold War began because of Stalin's desire to maintain direct control over his hard-won territorial gains in Europe. When Hitler launched Operation Barbarossa in 1941, the speed with which the Wehrmacht swept over the Eastern European plains shocked the world. In less than a month, German troops conquered more than half of the essentially flat terrain between East Prussia and Moscow. Had Hitler not delayed his assault on the capital in a vain effort to take Leningrad, he would likely have captured the prize that had eluded Napoleon a century earlier. From Stalin's perspective, holding on to Eastern Europe after the Second World War was thus a matter of survival. Forty years later the Soviet Union struggled amid social sclerosis end economic stagnation, and its hold on Eastern Europe began to slip. When reunification became increasingly foreseeable, Gorbachev decided that his nation's interests were best-served by a united Germany firmly in NATO's camp, rather than dealing with Russia's nightmare – a resurgent, independent German threat in the heart of Europe. The key juncture on the road to reunification came in May 1990 in Washington, DC, where Gorbachev suddenly agreed – to the dismay of his Soviet retinue – that the basis for Europe's post-Soviet order was to be the Helsinki principle. By accepting this principle, Gorbachev agreed to a reunified Germany within NATO. Signed in 1975 by Gerald Ford and Leonid Brezhnev, the Helsinki Final Act was the centrepiece of détente, the high-level effort started by Richard Nixon to normalise East-West relations through arms control (though not arms reductions) and the recognition of two separate spheres of alliances. The Helsinki Declaration formally recognised the sovereign equality of Eastern and Western nations, their respective territorial integrity, and non-interference in each other's sovereign affairs. Helsinki also embraced the peaceful settlement of disputes as a fundamental principle. 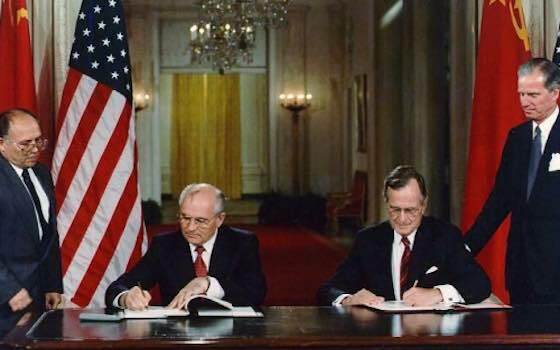 The Helsinki Accords were signed when the Soviet Union was at the pinnacle of its power. Militarily, the USSR was viewed as an equal to post-Vietnam America. Politically, the Communist bloc's global reach was greater than ever before, with revolutionary movements taking hold in Africa and Latin America. Economically, the oil- and gas-rich Soviet bloc was reaping the rewards of OPEC's oil embargo, which inflicted stagflation on Western economies and simultaneously boosted the USSR's export earnings. At Helsinki, the USSR had achieved the formal recognition of its sphere of influence, something its leadership had craved since the Second World War. It is no wonder that Brezhnev told the Politburo by the end of the 1970s that the ‘global correlation of forces' was moving in their favour. The historical irony is that Helsinki, seen by the Soviets as their biggest diplomatic victory since the creation of the Warsaw Pact, contained the seeds of the USSR's subsequent implosion. First, it explicitly referred to the inalienability of basic human rights and freedoms, which eventually – and unforeseeably – galvanised dissidents across the Eastern bloc, culminating in the revolutions of 1989. Second, Helsinki ratified the principle that European states were free to choose their alliances. Originally meant to legitimise it, Helsinki thus ended up undermining the Warsaw Pact politically. That is why the Helsinki Principle of free choice is the central legacy of the Cold War's end. It explains what happened to the USSR's former dominions after 1991: NATO's newest members were neither coerced into joining, nor absorbed by an expansionist alliance. On the contrary, they joined up voluntarily and by popular demand, on the basis of the sovereign right to freely enter international alliances. In this sense, NATO represents the crowning achievement of Woodrow Wilson's principle of national self-determination – some 80 years after Wilson first outlined it. And yet since the mid-1990s, Russia's political class has consistently pushed the narrative that NATO's eastward expansion represented a betrayal of the post-Cold War settlement. Putin portrays his military interventions in Georgia and Ukraine as a legitimate response to NATO's empire-building. This is Russia's equivalent to Germany's ‘stab in the back' myth of 1918: a convenient shibboleth to justify nationalist aggression. Why can this be asserted with relative certainty? Because Russia's Western borders are safe: Stalin's Eastern European buffer zone to protect against foreign invasion is not need any longer. No one views Poland, Slovakia or Bulgaria as threats to Russian security. As for Ukraine, under the Budapest accords of 1994, it memorably returned its sizeable nuclear arsenal to Russia, in return for binding international guarantees of its territorial sovereignty – the only voluntary act of state nuclear disarmament in history. Indeed, until Putin launched his Crimean military adventure, Russia had been safe from attack on its Western flank, arguably for the first time in its history. Putin chose to unilaterally violate the Budapest treaty in pursuit of Russian national interests and to entrench his power domestically. In the process, he has undermined Russian claims that NATO aggression lies behind the crisis in Ukraine. The true catalyst of the crisis was a popular revolution in Kiev against an autocratic and corrupt regime that did not shy away from killing unarmed demonstrators. If the rise of civil society against kleptocracy is enough to trigger Russian intervention in a neighbouring state, NATO's expansion takes on a much greater significance: in its absence, it would be hard to imagine the entrenchment of democracy and the rule of law in Eastern Europe, exemplified by success stories like Poland, the Czech Republic and the Baltic states. In 1990, Margaret Thatcher warned against German reunification: instead of anchoring Germany to Europe, she argued, Europe was anchoring itself to Germany. The fear of Teutonic resurgence resonated as much in Moscow as it did in Western European capitals. In a way, Thatcher was right, though not how she foresaw it. Today, a rich and powerful Germany, fearful of its militaristic past, struggles to assume leadership in Europe's foreign affairs. The country's military is in a dismal state, something successive German defence ministers have repeatedly tried and failed to fix. The army performs poorly in combat missions, demonstrated most recently in Afghanistan, and report after report published by the Defence Ministry exposes serious gaps in military readiness. Most recently it was reported that Germany's military actually fails to spend all of its allocated equipment budget – despite the fact that just one-third of its helicopters are currently flightworthy and less than half of its tanks are fit for deployment. In the Hobbesian world of international affairs (unlike the Kantian world of European affairs), Germany is not taken seriously as a power broker. Certainly, it is no military threat to anyone, least of all Russia. While Germany has thus overcome its aggressive past, Russia remains mired in it. As we adjust to a new reality of competition at Europe's Eastern fringes, it is important to bear the end of the Cold War in mind. In 1989, it was not armed force that won the Cold War, but an idea: freedom of choice, both of governments and alliances. This is the principle that confronted a young Vladimir Putin so vividly 25 years ago in East Germany. Today, as we witness the final convulsions of a declining post-imperial power run by a revanchist Cold War survivor, the task of Europe's statesmen is to devise a strategy to deal with this reality. Benjamin Mueller is a doctoral candidate in International Relations at the London School of Economics. He is also the International Relations Stonex Scholar at LSE IDEAS. Article: "From 1989 to 2014: Young Vladimir Putin and the Irony of Helsinki is republished with permission of International Relations and Security Network (ISN)." "From 1989 to 2014: Young Vladimir Putin and the Irony of Helsinki"